This are pretty basic x86 win32 binaries…. I haven’t added anything so they are pretty stock. The FULL package is here, while a smaller download for people only interested in the x86/x64 emulators is available here. 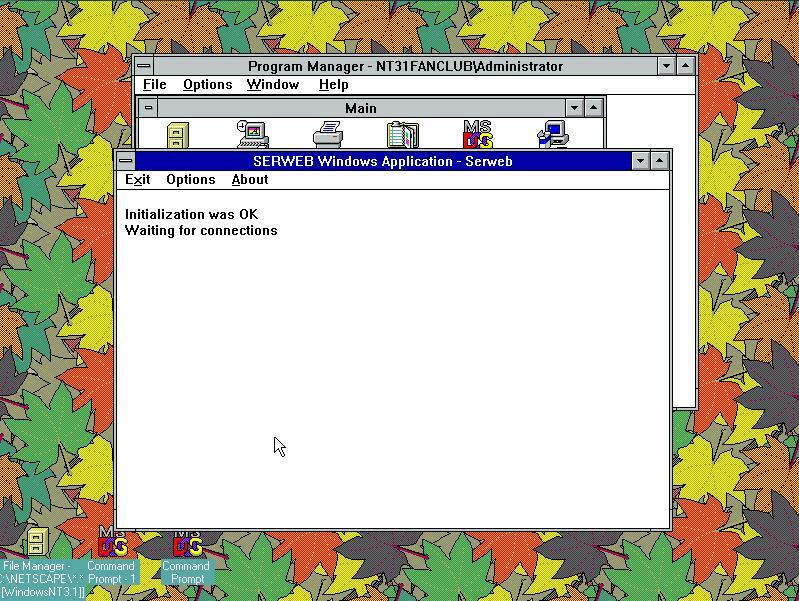 I’ve only tested Windows NT 4.0/MIPS and MS-DOS but everything seemed to work ok.
Other then that, the move continues…. I wonder if the NOVA’s were that bad…? 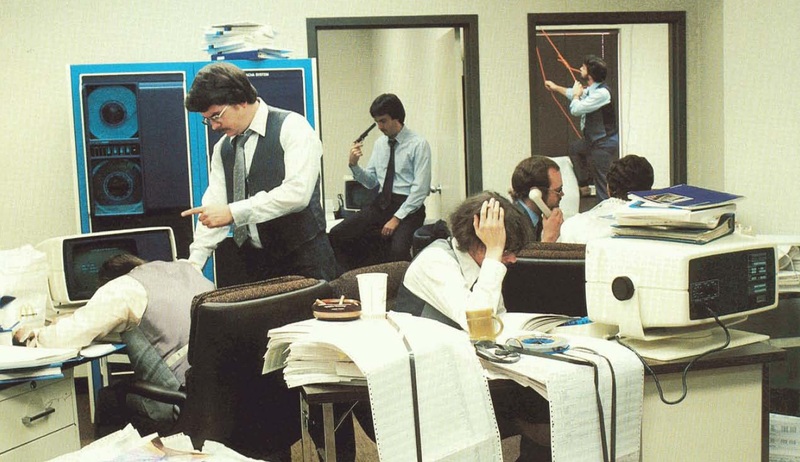 I came across this great picture from a brochure promoting an operating environment called Dimension for various NOVA machines, back in the 1970s. And there is plenty more to be found in the Computer History Museum. 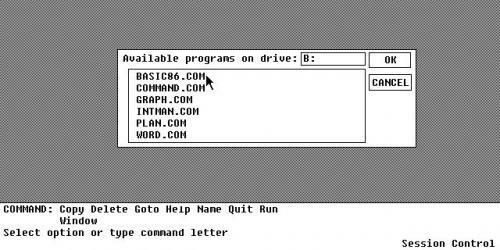 And speaking of the CHM, they have posted the source code for Quick Draw & MacPaint. I haven’t even tried to see what is involved to build them, but I’m sure it’s good fun for someone out there. I’m sure this is day late & dollar short, but I think it’s kinda interesting! Author neozeedPosted on July 22, 2010 March 27, 2016 Categories random updatesLeave a comment on One of those days…. A long time ago, I had this 286 computer, and I thought it was so cool because I had a 287XL math co-processor. It basically was a 80387 math chip that was wedged to work on a 80286 computer. 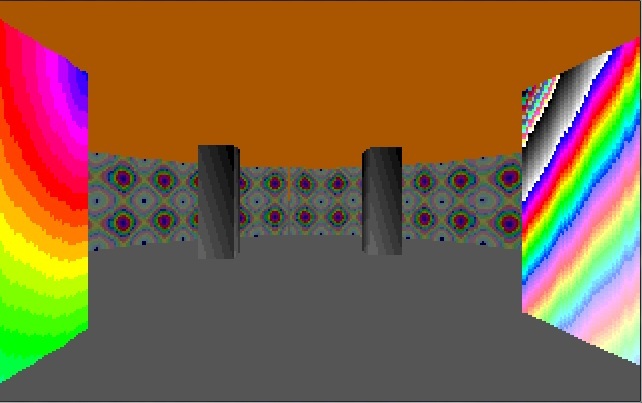 And it being the early 1990’s the one thing everyone loved to do was to show off rendering stuff. I’ve long since lost all my stuff, but I do remember the ‘switch’ from DKBTrace to POV-Ray. I did lament at the time that doing a good ‘quality’ render could take a week or more… And power in South Florida being a ‘best effort service’ wasn’t very forgiving for those of us on FPL. But it was still very neat and exciting for the time. OpenGL kind of killed that as now you could do ‘good enough’ stuff in realtime! Anyways I was googling around checking out pageranks (I know so shameless) when I came across Kurt Bangert’s page, that included a POV-Ray scene with some fun filled Fortran stuff. So after downloading the files, and the latest POV-Ray (3.7), and fixing a trivial line I was able to render the above picture in 16 minutes!! I figured by now POV-Ray could support SMP, and found the new beta version, that supports SMP! So on my HP laptop with 4 cores, and hyperthreading enabled, I was able to render the scene in 1.5 minutes in 1024×768 resolution!! 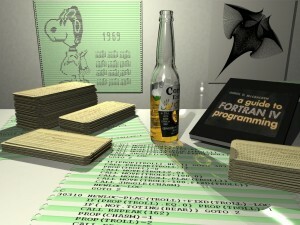 The Fortran printout is the ‘adventure’ cave game, along with another variation of the snoopy Fortran calendar. 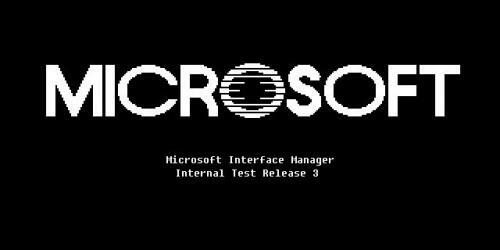 A friend pointed me to this site, as it has pictures of the 1983 Comdex version of Microsoft Interface Manager… This was the start of all things Windows. Now “oscollect.ru” is Russian, and I figured I’d provide a mechanical translation (google) of the page for anyone that wants to at least experience a little of the magic that was MIM. Develop graphics engine, known as Interface Manager, started in 1983. Microsoft was first shown at the exhibition Comdex’83, where and preserved its screenshots. According to foreign colleagues, given shots – a restored image from photographs. 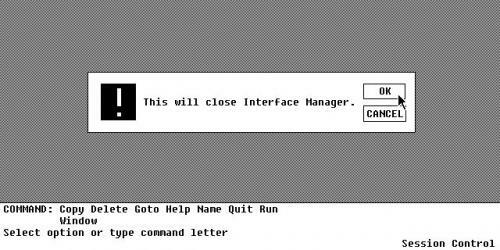 In 1984, Interface Manager has been renamed in Windows. First StartAs can be seen in the photograph, design and concept of Interface Manager is very different from that seen in the first versions of Windows. 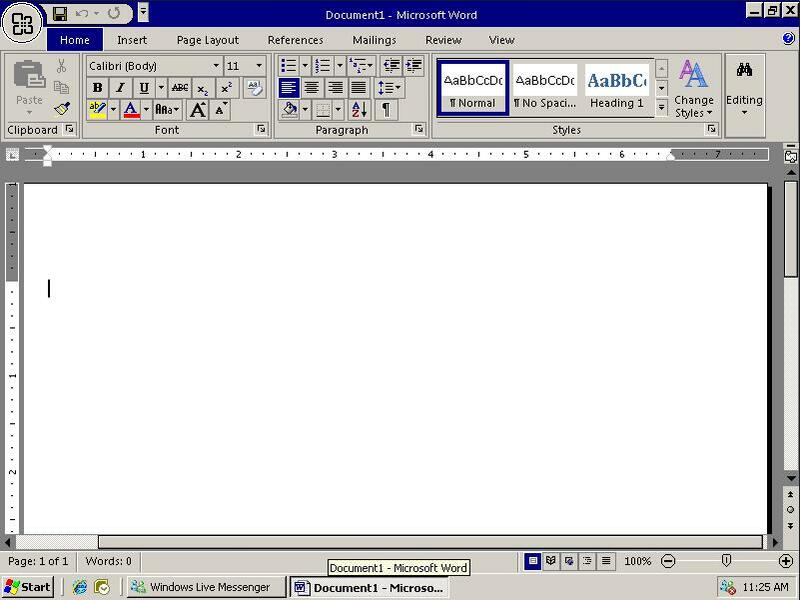 The screen is divided into two parts: the panel available at this time teams, and the “working area” where windows are placed open applications. When you start a text editor set of commands on the toolbar at the bottom has changed, ie Apparently, there appear general commands, or commands for the currently active window. Just can not help noticing that quite diverse controls window. In the upper right corner there’s a icon in a folder, for what he says I do not know exactly, but perhaps this is the system menu. 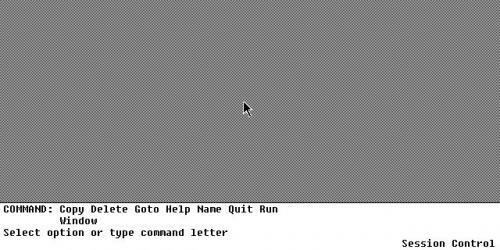 But I do think it’s very interesting that even back in 1983, The whole menu and ‘run’ commands at the bottom of the screen were there…. 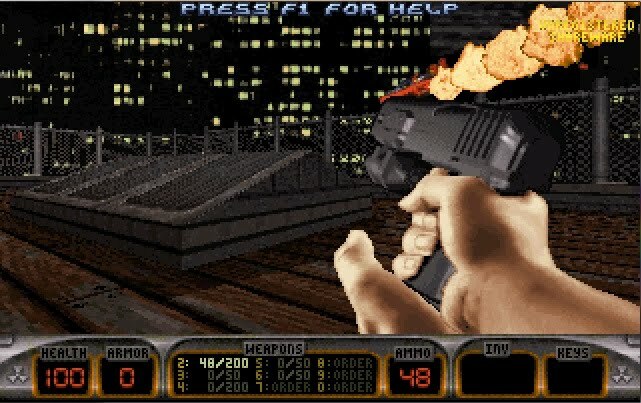 Well I was looking at some stuff on old games, and naturally everyone always did love Duke Nukem 3D! Now what is really cool, is that that the guy behind the build engine, Ken Silverman released the source to the ‘build’ engine, but also some of the builds of build as it progressed. 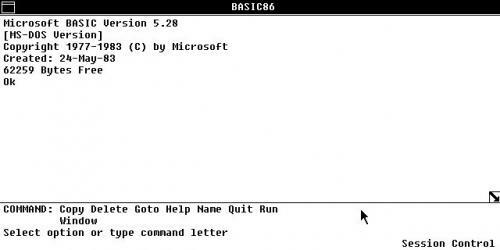 Ken is a big fan of QuickBasic, so to compile his earliest version, you’ll need QuickBasic 4.5, or the QBasic that came with MS-DOS 5.0 and above. Under some emulators (Virtual PC) you’ll get a corrupted screen at first, hit any of the arrow keys, and it’ll redraw the screen into what it should look like. Considering the 8kb of basic code includes the engine, and the map it’s pretty snazzy! You can find the timeline, and other versions of the build engine as it progressed on Ken’s web page. As the engine improved, and was ported into C, it only got better! Then it was sold and licensed out, which gave rise to great games like 3D Realms Duke Nukem! After the build engine went open, 3D realms followed up, in releasing their extensive modifications to build which can be found here. In the off chance you don’t have the game, you can still get the shareware version of it from 3D Realms here, and of course the full version on Good Old Games for $5.99 USD. With the release of Build & Duke 3D, it’s only natural that they shed their humble MS-DOS beginnings and found their way onto Windows as full Win32 applications taking advantage of the hardware. Thanks to the work of Ken & Jonathon. You can find the results on Jonathon Fowler’s page here. I suppose later I’ll have to see if it’ll build with the win64 tools… It’s be neat for a 64bit version of Duke! Dude, where is my screen?? But I just found out on TWiT that by simply hitting CTRL+F1 you can get rid of that ribbon that blocks 1/3rd of your visible screen area…! Far more information available on their website. It’s been over 100F the last few days in NYC, and frankly it’s been too hot to do much of anything. I know this is a scant update, but I’m still alive, if not lying on the floor in a puddle….. Author neozeedPosted on July 7, 2010 April 22, 2016 Categories 68000, Amiga, m68k, random updates, UAELeave a comment on WinUAE 2.2.0 released! Then the other day, I actually found the source code to serweb! So the first thing I did was to remove the message box function that was preventing me from letting this thing ‘just run’. Well that was cool, but I wondered if this thing was from 1993, meaning it’s MFC dependencies shouldn’t be that involved it may even port to a Win32 application. 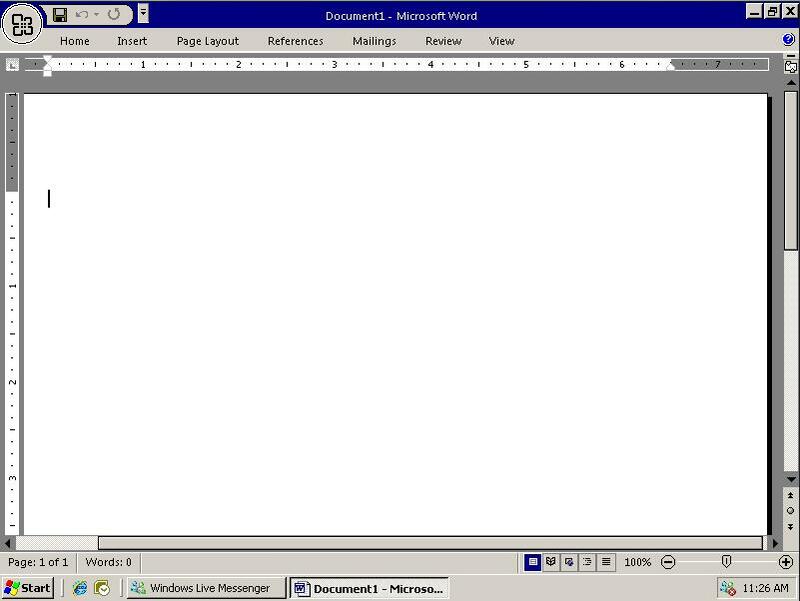 So with a few tweaks, mostly in the resource scripts, I was able to rebuild serweb as a win32 application! For the 2-3 people who care about this kind of thing, you can download it here. I would suspect it’d run on the Dec Alpha or the MIPS, but I haven’t even tried to build it there, as I run NT 4.0 on both of those platforms, and I end up using the IIS that is available. I do have to admit, I’m kinda surprised that Visual C++ 1.0 for Win32 could handle this… I’ve had pretty mixed results with it, but oddly enough converting a MFC Win16 to a Win32 MFC app seemed somewhat straight forward. It’s probably more so to Gus Estrella’s work then anything I did…! Artyom Tarasenko on Installing AIX on Qemu! Ian Dunbar on Installing AIX on Qemu!